If you’re a small business owner or freelance digital marketer, you know how frustrating WordPress maintenance can be. Most of the time, there’s no problem at all. But when there is, all hell breaks loose. I’ve had some sites that I manage coast for months, then I get the dreaded warning. To a novice WordPress site manager, these are nightmares. Now, at this point the options are difficult. Do you go find a random person on UpWork for cheap? Do you hire an expensive developer at $100+/hr? It’s all very confusing. Thankfully, there are companies like WP Buffs to solve that problem. 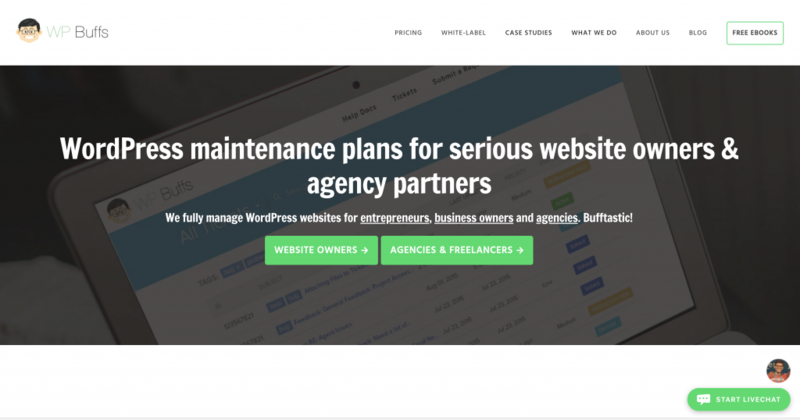 This little niche of WordPress maintenance companies started with WP Curve and Dan Norris a few years ago. They burst onto the scene and became popular very quickly. Unfortunately, they were bought out by big bad GoDaddy and my personal experience with them after that transition was TERRIBLE. Thankfully, WP Buffs is the spiritual successor to WP Curve – and dare I say better? They respond very quickly, have an awesome task management system, and have a virtually remote team to handle any time zone. There have been a few hiccups here and there, but overall, it’s the best money you can spend online.